The basic HTML code for a canvas is shown below. Before we you do anything with a canvas you need to understand it's coordinate system. A canvas can be visualized as a grid with its origin (0,0) in the upper-left corner. 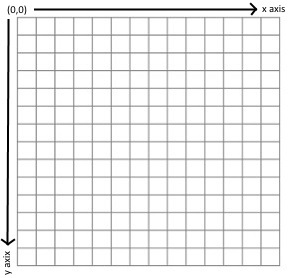 The x axis runs left-to-right, increasing in value as you move to the right. The y axis runs top-to-bottom, increasing as you move downward. The next thing you need to understand is how a context works. A context is like a box of drawing tools. For drawing lines, the context's .strokestyle property defines the color of your pen. The context's .linewidth property defines the thickness of the line. So before you attempt to draw a line, you need to configure your drawing context as shown below.